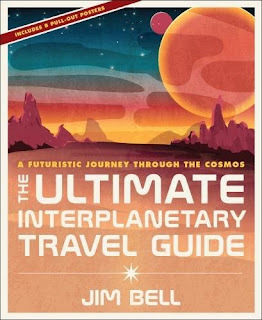 Not too long ago, NASA brought out a series of spoof ‘space tourism’ posters for various destinations in the Solar System. For people like me, who have watched NASA depressingly fail to send humans to the other planets for decade after decade, it was just another painful twist of the knife. On the other hand, the posters probably have more appeal for younger and less cynical minds, by presenting familiar astronomical objects in a new and engaging way. There may even be scope for a whole book along these lines – and that’s what Jim Bell has attempted here. The main thing I learned from it is that my brain is programmed to read either fiction or non-fiction, and can’t handle a 50:50 mix of the two – which is what this book is. It drove me mad – not least because I could see that the same material, presented as straight non-fiction, could have made a really excellent book. Using the NASA posters as a starting point, he could have enumerated the potential ‘tourist sights’ at each location, describing them as they would look to a human observer up close, and what special equipment or precautions would be necessary. That much is purely factual. The next question is what would need to happen to make such a tourist trip practical – if such-and-such a technology is developed, if such-and-such a social/economic/cultural trend is reversed, etc. By making all those ifs explicit, readers could judge for themselves whether the author is talking sense or not. But Bell doesn’t do that. He writes the book as if it’s an actual tourist guide from 200 years in the future, with no distinction between what is real and what is speculation. There are data tables showing hard facts like diameters and surface temperatures, alongside travel times from Earth (e.g. 6 hours to the Moon and a month to Jupiter) that are meaningless without some indication of the technology being assumed. Tourist attractions range from ‘real’ ones (natural features and historic landing sites), through sensible speculations (e.g. ice mines on the Moon and deep-sea research stations on Europa) to completely arbitrary ones (Star Wars style speeder races on Mercury and jazz festivals on Deimos). I’m not being overly kind about the book, because this is a popular science website aimed at adult readers and that’s who I’m reviewing it for. In all fairness, however, that’s probably not the author’s target audience. I can see that sci-fi fans with little interest in the ‘boring’ details of real-world science may well love the book. It’s certainly a very attractive package, with full-colour illustrations on every page and no dauntingly long blocks of text to read. It looks, in fact, just like one of those lavish coffee table books you see in The Works just before Christmas each year. I’ll even hazard a prediction of my own at this point. Possibly this Christmas, or failing that Christmas 2019, you’re going to see this book on sale in The Works at a very affordable price. If you happen to be looking for a present for a sci-fi mad youngster, it will be just the thing.